Acurious phenomenon that ac-companies certain guitar compa-nies is an inability to translate success from one medium to another. For instance, Martin has never been able to transfer its reputation for high-quality acoustics to electric guitars. And Fender has never been able, on its own, to really succeed in marketing acoustic guitars. Instead, it purchased Guild. Another example is Ovation, the company that almost single-handedly created the acoustic/electric category and radically altered views about how acoustic guitars should be constructed. No matter how hard they tried, Ovation’s repeated attempts to enter the solidbody electric area have failed. Instead, Ovation finally purchased Hamer. However, Ovation’s marketing failures do not mean it hasn’t made some pretty interesting – even innovative – electric guitars over the years, and these represent one of few areas in guitar collecting where you can find excellent, historically significant instruments, often at remarkably reasonable prices. Here’s the scoop on Ovation electrics (touching only briefly on acoustic/electrics). More information on Ovation can be obtained from Walter Carter’s book, The History of the Ovation Guitar (Hal Leonard, ’96), although solidbody electrics are not the primary focus, and some inconsistencies exist between the text and the model tables (when in doubt, the text seems to be more reliable). Except for using Carter’s book to confirm some dates and a few details, most of the information presented here was gathered independently prior to publication of that book. In a way, the Ovation story (to use Robert Frost’s famous metaphor) is one of roads not taken. Of course, as the philosopher, Hegel, so neatly noted long ago, the paths tend to join up again, and the resulting synthesis works out fine in the end. It certainly worked that way for Charlie Kaman, whose choice of paths ultimately led to the synthesis (in more ways than one!) of Ovation guitars. Ovation guitars are the brainchild of Charles H. Kaman (rhymes with command), born in 1918, the son of a construction crew foreman. At 12 or 13, Kaman began playing an old Stella acoustic guitar, later switching to a Martin C-7. Guitar playing became one of Charles’ passions. Another passion involved the physical sciences. Kaman subsequently attended the University of Washington, D.C., studying aeronautical engineering, and his guitar fix was supplied by playing clubs with a little jazz combo in his spare time. Then, one weekend his combo got the biggest gig of its career – opening for Tommy Dorsey and his orchestra. Charlie was hot that night, and Dorsey took notice. In one of those rare coincidences, Dorsey’s guitar player had just quit, and the next day Kaman was offered the job. Which path does the son of a construction foreman pursue? The uncertain, fleeting glory of the entertainment industry, or the unknown possibilities of putting craft in the air? Dorsey’s orchestra left town without Charles Kaman. After graduating, Kaman got a job developing the Sikorsky helicopter. Ironically, his assignment involved transmission of vibration from the wood rotor blades to the body. Kaman helped come up with a solution that combined wood with a new synthetic plastic material that provided insulation. However, management was not interested in his ideas. Ideas in hand, in 1945 Kaman launched out on his own and started the Kaman Corporation. For two decades he built a successful business in military helicopters. Business thrived until, as the Vietnam war was heating up, Secretary of Defense Robert S. McNamara cancelled an order for 250 helicopters. Diversification was in order. Kaman was experienced in making items of wood, metal, and high-tech material requiring high tolerances. He considered expanding the business into everything from surfboards to sailboats, candy packaging machines to Winnebagos, but these industries were all well-established and well-financed. This is where the roads came back together. Kaman continued to play guitar during his building of the helicopter business. He kept his guitars hanging on the wall, instead of in the case, so he could grab one if he felt like playing. As a result he ended up with lots of cracked backs, including one on a favorite Martin. Charles traveled down to Nazareth to get the guitar repaired and Fred Martin gave him a factory tour. Kaman realized how he could put his skills to another use. Kaman’s helicopter blades were made of Sitka spruce, like Martin’s guitar tops, and with their expertise in precision tooling, he felt he could make guitars. Kaman offered to buy Martin guitars, but was politely turned down. A second offer was refused, but the idea didn’t die. Shortly thereafter, Kaman visited the Harmony factory in Chicago and offered to buy it from Charles Rubovitz, who also declined. Guitars were still hot properties in those days. Thrice spurned, Kaman decided to do it himself. Back at the blade factory was a worker who played violin. Kaman pulled him out of chopper blades, and together they set up a guitarmaking operation. The problem that had led to Martin and the idea of making guitars in the first place also led Kaman to the idea of using synthetic materials in guitars. He realized he could use a composite fiberglass to “improve” two aspects of guitar construction. He could solve the problem of cracking due to wood shrinkage caused by changes in heat and humidity, and he could improve vibration transmission from the back because fiberglass actually resonates at frequencies similar to many woods, but is more efficient (wood actually absorbs some of the instrument’s vibrations). Kaman and his technicians began by building traditional square-backed guitars, but by the sixth prototype were using oscilloscopes to develop the now familiar bowl-backed shape, its spherical shape being self-reinforcing, thus eliminating the need for bracing. After some experimentation, the carved, round-crowned Ovation three-and-three headstock was developed. The modern Ovation guitar with a Lyracord back was born. Kaman began producing guitars in 1966, and Charles went on the road to promote his new creation. His first stop was a visit to his old stomping grounds, Washington, D.C., where he showed his guitar to jazz guitar great Charlie Byrd. Byrd was impressed and felt the guitar – which was quite loud – had considerable potential. He later remarked that the guitar “deserved an ovation,” thus providing the guitars with a name. Byrd recommended Kaman show his guitar to folk singer Josh White, who was performing in town at the time. Kaman promptly did so, and for White, it was love at first strum. He enthusiastically agreed to have an Ovation guitar made to his specs, and became the first Ovation endorser, in ’66 and brought his entire family to Connecticut to pick up his first guitar, playing the first Ovation concert with his new guitar. Byrd did eventually get a classical guitar from Ovation, and performed with it for many years. In ’67, Ovation relocated to New Hartford, Connecticut. Ovation guitars progressed slowly. While they created a lot of buzz, the new idea was, by and large, viewed skeptically. Until 1969, Ovation guitars struggled. Searching for something to give them a boost, in July ’68, Ovation introduced its first electric guitars – the Electric Storm series. Two models were available initially, the Thunderhead and the Tornado. These were f-hole semi-hollowbody thinline, equal double-cutaway guitars with German-made bodies, bolt-on Ovation necks, and Schaller hardware. Most had Schaller pickups with metal covers, a row of poles along each edge, and split, small, black inserts in the middle. Each was available with or without vibrato. The Thunderhead had two humbuckers, gold hardware, a master volume with two tone controls, a pickup blender knob, and a phase reversal switch. Some had DeArmond pickups with metal covers, a large black insert with nonadjustable poles, plus six tiny adjustable pole screws along one edge. The ebony fingerboard was bound with diamond inlays and had the characteristic “mustache” on the end of the fingerboard. The tops and backs featured figured maple laminates. Colors options included a wine red, sunburst natural, and green (on Thunderhead only). The Thunderhead K-1360 had a trapeze tail, the K-1460 a vibrato. The Tornado (K-1160 with trapeze, K-1260 with vibrato) was a downscale version with plain top, chrome hardware, two volume and two tone controls (no phase), and the Schaller pickups. The Thunderhead guitars would be offered until June of ’72, with several model designation changes along the way. In ’70, the K-1360 became the K-1213, and in May of the following year changed again to the K-1233. At the same time, the vibrato-equipped models also changed, the K-1460 becoming the K-1214 and then the K-1234. The Tornado lasted until the end in January, ’73, but also went through the model number changes along with the Thunderheads, the K-1160 becoming the K-1211 and then the K-1231. The vibrato Tornados went from K-1260 to K-1212 and then K-1232. In August ’68, Ovation added three more models – the Hurricane 12-string and the Typhoon I and II basses, all with chrome hardware. The K-1120 Hurricane was a Tornado with the extra strings, advertised as offering a “harpsichordian” effect. This lasted only a year and was gone by ’69. The initial Typhoon basses had slightly smaller bodies than the guitars, with stubbier, more flared horns. 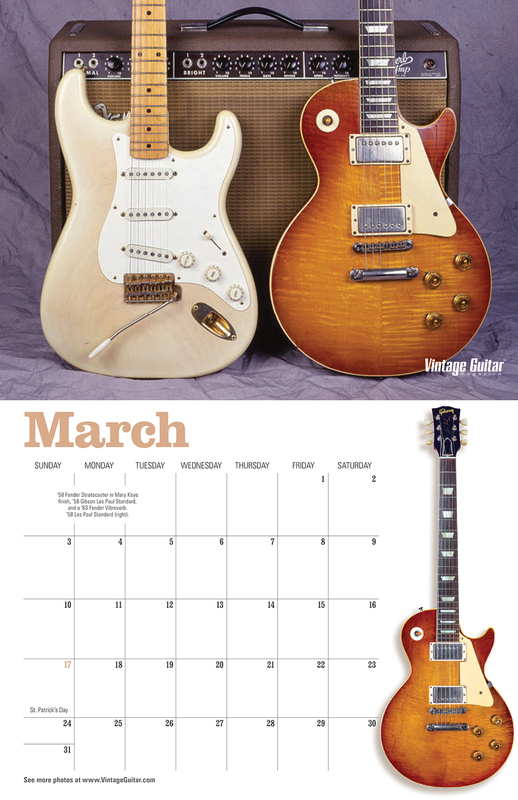 These lasted only a year until ’69, when the body styling changed to that of the Gibson-style guitars. The K-1140 Typhoon I bass had one Schaller pickup and a covered bridge/tailpiece assembly. The K-1240 Typhoon II was a two-pickup model with a three-way select. This was also called the Williwaw (“mountain wind”) in some Ovation literature, but it was never really called that. The Typhoon I was only available in the stubby body and was discontinued in ’69. The Typhoon II changed model number in March ’70, becoming the K-1222. This model made it until June ’72. Ovation’s Electric Storm series couldn’t have hit the market at a worse time. In ’67 electric guitars sales began to slump and the market took a dive in ’68. A bunch of Japanese companies went out of business, as did one of America’s largest mass manufacturers, the newly merged Valco/Kay. The Storms were so unsuccessful it appears Ovation actually stopped importing parts in ’69, although it had enough components in stock to keep the line active until early ’73. In August ’69, Ovation introduced the Typhoon III bass, a fairly rare fretless version of the II with painted “frets” and no position markers. This was followed by the K-1216 Typhoon IV in March ’70, another fretless. In May ’71, Ovation tried once more. It introduced the K-1217 Typhoon V bass, about which no information is available, but based on the Eclipse, the difference may have been pickups. The K-1235 Eclipse was also introduced. This was a guitar offered only in a black finish that looks somewhat like graphite. It had chrome hardware, no binding, dot inlays, three-way select and two volume and two tone controls. The pickups had metal covers with black inserts and a single blade-style pole. In June ’72, all Electric Storms were discontinued except the Tornado and Eclipse, which made it another half year, until January ’73, by which time the Electric Storm had subsided into quiescence. Campbell related his first encounter with Kaman in an interview a few years back, and he was immediately attracted to the Ovation concept. “I liked the ruggedness of the guitar, which was good for on the road,” said Campbell. “It had a briskness of sound that I liked.” Kaman gave the guitar to him. Shortly thereafter, in ’69 Campbell scored his own TV show, the “Goodtime Hour.” Suddenly, coming into millions of living rooms across America, was a smiling Glen Campbell plunking on a fiberglass bowl-backed Ovation guitar, and Ovation took off. Indeed, it was Campbell who was directly responsible for the development of Ovation’s acoustic/electric piezo pickup system. Basically, Campbell didn’t like to have to stand in front of a microphone all the time and wanted the ability to be more mobile. In late ’69 and early ’70, Ovation underwent intense development to devise its under-saddle transducer pickup. Campbell adopted it, and Ovation had its ticket to commercial success. Initially, the system was offered as an option to Ovation’s regular acoustic line. Jim Croce and Jim Messina were other early artists to take to it. Around 1970-’71, Kaman Music began to expand its marketing base by purchasing Coast Wholesale Companies, in California, followed by the acquisition of C. Bruno (San Antonio and New York), and the National Music String company. This dramatically increased channels of distribution. Through established business connections, the purchase of Coast also marked the beginning of a long, fruitful relationship with Takamine, the Japanese manufacturer for whom Kaman Music remains the exclusive distributor. As the ’70s dawned, the market for electric guitars began to revive, significantly but conservatively. Gibson retracted its hopes for the flagship SG and reintroduced the Les Paul in ’68. Fender, likewise, was moving away from Jazzmasters and Jaguars, concentrating on its earlier successes, the Stratocaster and Telecaster. 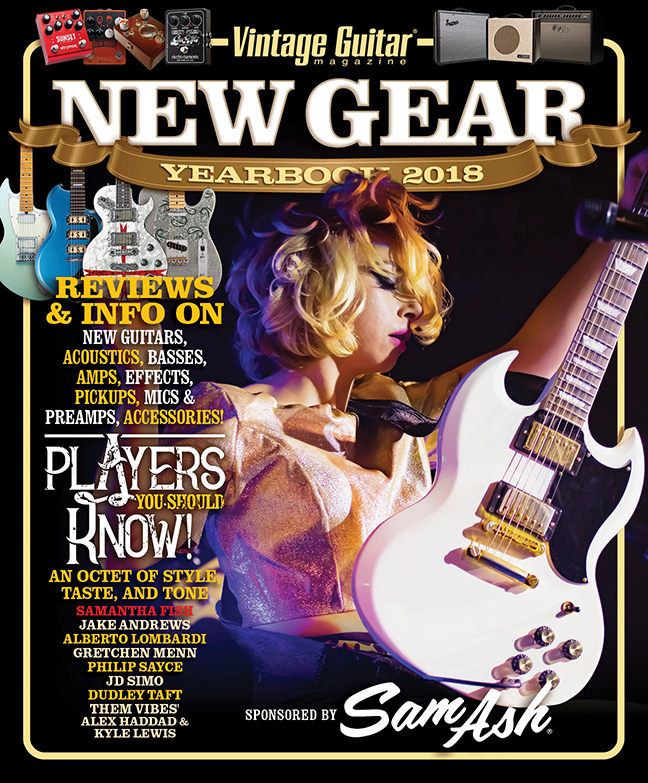 Paced by Shiro Arai of Aria, who’d been inspired by the reissue of the Les Paul (a “copy” of the ’50s classic), Japanese manufacturers were beginning to explore making copies of popular American designs, and the “copy era” was getting underway. In the face of this mounting conservatism, Ovation entered the solidbody marketplace with an in-your-face design consistent with the radicalism of its Lyracord bowl-backed acoustics. In ’71 it unveiled the battleaxe-shaped Breadwinner, followed by its upmarket brother, the Deacon, in January ’72. As you might expect, despite the unusual shape (rounded upper edge, deep single cutaway at the double octave, s-curved lower edge, and asymmetrically scooped out lower bout) these also featured some innovations. Both had two-octave bolt-on Ovation fingerboards, the former unbound with dots, the latter bound with diamonds. Both had mahogany bodies, the Breadwinner with a kind of spackle finish (white, black, tan or blue), the Deacon a sunburst finish. The Breadwinner had a molded plastic bridge/tailpiece assembly with adjustable plastic saddles and chrome hardware; the Deacon had a similar unit with metal saddles with gold hardware. Early Breadwinners had the jack on the back of the body, but this quickly migrated to the pickguard; some transitional examples have both jacks on the back and pickguard. These Ovation guitars were remarkably ergonomic, well-balanced when standing and cradling comfortably on the knee if you preferred to sit. Both had unique, wide, Toroidal contoured-cover pickups with 12 individual polepieces, and six rectangular, adjustable screws. But the real innovation was an onboard FET (field-effect transistor) preamp, arguably the first production active electronic system. Onboard effects had already appeared on various guitars, especially Höfner and Vox models, but these were not truly “active” in the modern sense. Alembic, with support from the Grateful Dead, was exploring active pickup systems, but these were still basically custom-made instruments. Both had a master volume and tone control with three-way select and a “band rejection filter tone switch,” also called a midrange bypass filter. Ovation was among the first to offer linear potentiometers to correlate movement with effect. Controls inside were mounted on a circuitboard with individual trim pots that can be adjusted to control the volume of each pickup. In a market filled with increasingly good Japanese copies of Les Pauls, the Ovation offerings fell, well, flat, despite obvious high quality. In ’75 both the Breadwinner and Deacon switched to Ovation humbucking pickups, metal covered with twin rows of six pole pieces. A very short-run Deacon 12-string debuted as well in ’75. In ’76 the blue finish on the Breadwinner was ditched and the Deacon acquired red, black and natural finish options. As synthesizer technology caught on in the late ’70s, some of these guitars became popular for adapting to synth playing, primarily because of their “high-tech” image. Around ’77 or so (since the new shape was similar to the Magnum basses), with sales embarrassingly bad, Ovation took some Deacon bodies and added new contours, carving a dip into the top curve and adding angles. It didn’t help. The Breadwinner was officially axed in ’79, with the Breadwinner loosing its head in ’80, although the market had long passed them by. It’s interesting to note that luthier Steve Klein introduced a guitar that got a lot of press in the early ’80s with a body virtually identical to the Ovation Breadwinner. According to Charles’ son (and future president of Kaman Corporation), Bill Kaman, Jr., Ovation considered “pointing this out” (i.e., legal action), but given its bad track record with solidbodies, figured it wasn’t worth the effort. 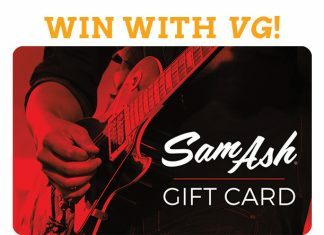 The decade of the ’70s is generally referred to as the “copy era,” with tastes dictated by original and copies of classic Gibson and Fender designs. Ovation backed off from its more exotic design directions and in ’77 introduced two more conservative models, the Preacher and the Viper, and its first solidbody basses, the Magnum I and II. The Preacher featured two equal cutaways, whereas the Viper sported more of a Les-Paul-style single cutaway, though neither would never be confused with a Gibson equivalent. Their shape was, in fact, essentially a downsized version of the Ovation acoustic outline. The Magnum shape was derived from the earlier Breadwinner and Deacon, with more contouring. The 1281 Preacher was a relatively conventional mahogany guitar with two Ovation humbuckers, three-way select, two volume and two tone controls. The humbuckers were smaller than typical, with metal covers and two rows of exposed adjustable polepieces. The pickups and three-way were mounted on a small black/white pickguard, with knobs on the body. Two jacks for mono or stereo output were mounted on the side of the lower bout. The two-octave unbound rosewood fingerboard had dot inlays. Early Preachers had “Preacher” engraved on the lower pickguard and a bridge/tailpiece assembly was similar to that on the Breadwinner/Deacon, with more metal and less plastic. Other versions are seen without the engraving and all-metal bridge/tailpieces, indicating the model evolved. Though no information is currently available on when the transition occurred, based on evidence from later UKs, it happened late, possibly around 1980. Also introduced at the time was the 1285 Preacher 12-String, essentially a regular Preacher outfitted with a twelve-string neck and special bridge/tailpiece to accommodate the extra strings. Later in ’75 the Preacher was joined by the 1282 Preacher Deluxe, an upscale version with a bound ebony fingerboard, abalone block inlays (with notched corners, giving an almost oval visual effect), and gold hardware. Deluxe pickups were active. The Deluxe had a larger pickguard with all controls mounted on it, including the addition of a series/parallel switch. Again, early examples had the model name on the pickguard and the plastic/metal bridge/tailpiece. Later, the engraving disappeared and the bridge became metal. The Viper came in two versions made of ash, maple, alder or mahogany, the 1271, with two single-coil pickups, and the 1273 Viper III with three single-coils. Vipers had two-octave unbound fingerboards of either rosewood with pearl dot inlays or maple with black dots. A laminated pickguard (with model name engraved) held the pickups and extended down the body for the controls, including master volume and tone knobs. The plastic-and-metal bridge/tailpiece assemblies were the same as on the early Preacher. The single-coil pickups were about the size of mini-humbuckers with metal sides, black inserts, and flat polepieces. Windings were different depending on the position. The bridge pickup had poles slanted diagonally that emulated the slant of a Strat. Early Vipers have a three-way toggle. As with the Preacher, later Vipers have no name engraving, the all-metal bridge assembly, and an extra toggle which is probably a series/parallel switch. The Viper III was similar to the Viper except it added a middle pickup. Pickups were controlled by three on/off toggles. Viper IIIs also evolved along the same lines as the Preacher and Viper. Vipers came in a variety of high-gloss finishes, including natural, a black/orange sunburst, green, and a black-blue sunburst, at least. Ovation’s first solidbody bass guitars were the 1261 Magnum I and 1262 Magnum II, introduced in 1977, as well. While not as exotic as the Breadwinner/Deacon, the mahogany Magnums had an elongated offset double cutaway design that basically had nothing to do with Fender. Surprised? The upper horn was a bit more extended than a Breadwinner and the upper edge had a slight waist. The lower bout cutout was not as dramatic as the guitar equivalent. Both basses had bolt-on mahogany necks reinforced by three strips of carbon graphite to eliminate warping, a wide strip in the center of the back and two more underneath the fingerboard. Fingerboards were unbound ebony with 20 frets and dot inlays. Both basses had a cast metal housing with two pickups, a small split double-coil unit at the bridge and a large square four-coil unit at the neck, this latter with little screw-adjusted trim pots for micro adjusting volume. The bridge/tailpiece was a heavy-duty plastic housing with heavy adjustable saddles. In front of the bridge was a lever-triggered mute. The primary difference between the I and II was in the electronics. The Magnum I had a three-way select with two volume and two tone controls. It also had two jacks allowing either mono or stereo output. The Magnum II had the three-way plus a master volume and an active three-band graphic equalizer, mono output only. The Magnums met with a reception roughly as enthusiastic as the previous Breadwinner and Deacon. In the Carter tables it suggests that the Magnum line was redesigned to look like more conventional Fender-style basses with offset double cutaways in 1978. Other than the body shape, the 1263 Magnum III was identical to the I, and the 1264 Magnum IV was the same as the II. However, the Magnum II continued to be advertised as late as 1980, and other sources date the Magnum III and IV to 1982, which is probably closer to the correct date, especially since they almost never show up on the market. Thus, I believe the proper chronology to be Magnum I and II available 1977-82 (give or take), with the Magnum III and IV available from 1982-83. Ovation’s Lyracord backs weren’t the company’s only fling with synthetic materials. In the early ’70s Charles Kaman set his engineers, many of whom were not guitar players, to work on developing a new synthetic guitar, yielding the deep-bowl, acoustic-electric Adamas which went into production in 1976. The Adamas top, called a Fibronic Soundboard, was made of a laminate of carbon-graphite and birch about a third the thickness of a conventional spruce top. Instead of a regular round central soundhole, Kaman engineers positioned 22 smaller holes on the upper shoulders surrounded by epaulets of multicolored woods in a kind of leaf design. The bridges and headstock featured elaborate scroll carving. The neck was reinforced with a patented Kaman bar, a u-shaped cast aluminum insert designed to keep the neck stable even with dramatic changes in temperature and climate. The necks and fingerboards were made of walnut. The fingerboards had hollow triangular maple inlays, tapered beginning at the 18th fret on the bass side to the 24th fret on the treble. Hardware was gold. Until the advent of Ovation’s Collector Series in 1982, the Adamas was Ovation’s flagship, favored by the likes of Larry Coryell and others. Indeed, the Adamas was not the only technological exploration conducted by Ovation. In 1973, as the threat of copying loomed, Ovation decided to manufacture its own inexpensive “copies.” Launching a full-out research effort Ovation came up with new bowl materials, a new way to make tops, and a new neck construction based on more technology used on the helicopter side. Necks consisted of an aluminum frame covered with a polyurethane foam material. These were called Applause. Initially these looked like more expensive Ovations, though in 1976 the design was changed to make them look different. Applause guitars were made in Kaman’s aerospace factory until 1983 when production shifted to Korea. The Applause line is relevant because the technology used to make the aluminum and foam necks was subsequently applied to Ovation’s final American-made solidbodies, the Ultra Kaman or UK II, which was introduced in 1979. The UK II featured an aluminum frame with a urethane foam (Urelite) body, featuring the usual Ovation shape but with a little Tele-style curve on the upper shoulder and a sharp single cutaway. The top featured a contour like a carved top, although it was molded, of course. The neck was typically Ovation, with a bound 24-fret ebony fingerboard. Pickups had changed to twin-blade humbuckers, still in the smaller Ovation size. Electronics were fairly conventional, with a three-way select, two volume and two tone controls. No reference materials are available to me, but it appears that the earliest UK IIs had a little Les-Paul-style elevated pickguard and hollow bow-tie inlays. Also, the early UK IIs seem to have the plastic and metal bridge assemblies seen on earlier Preachers and Vipers. Later versions have the notched abalone block inlays, no pickguard and all-metal bridge assemblies. This is what makes me think the switch to metal bridges occurred in around 1980. As far as I know, the model name never appeared on the pickguard! After 15 years of making electrics, Ovation finally threw in the towel on making its own electric guitars and basses in 1983. All models still begin made were discontinued at that time. About the only “star” to play Ovation solidbodies briefly was Jim Messina, though the Strawbs briefly endorsed them. However, Ovation did not give up on the solidbody electric guitar market. In around 1985, Ovation contracted with a Korean company to make guitar necks and bodies which it imported and assembled in the U.S. using Schaller hardware and DiMarzio pickups. These were called the Ultra Hard Bodies (advertised with a cute chick in spandex), and consisted of at least four guitar models and one bass. The guitars included three bolt-neck Strat-style models, the GS-1 (one humbucker), GS-2 (two humbuckers) and GS-3 (humbucker/single/single). Most had locking Kahler vibratos, although at least one GS-3 has been seen with a traditional fulcrum vibrato. The bodies had a German carve relief beginning at the waist and extending forward to the cutaway horns. The necks had 21-fret rosewood or maple fingerboards with dots. The six-in-line heads were kind of squarish and bi-level, with a carved relief along the lower edge, kind of an Ovation trademark. The logos said Ovation Ultra GS. The GS-1 (volume only) and GS-2 (volume, tone, three-way) had pickups mounted on rings on the top. The GS-3 featured a black Strat-style pickguard. One source refers to a GSL model, but nothing is known about what this means, if it isn’t a typo. Most of these came with typical exposed-pole DiMarzios, but the previously mentioned guitar with the fulcrum vibrato also had twin-blade pickups with DiMarzio stenciled on the covers. 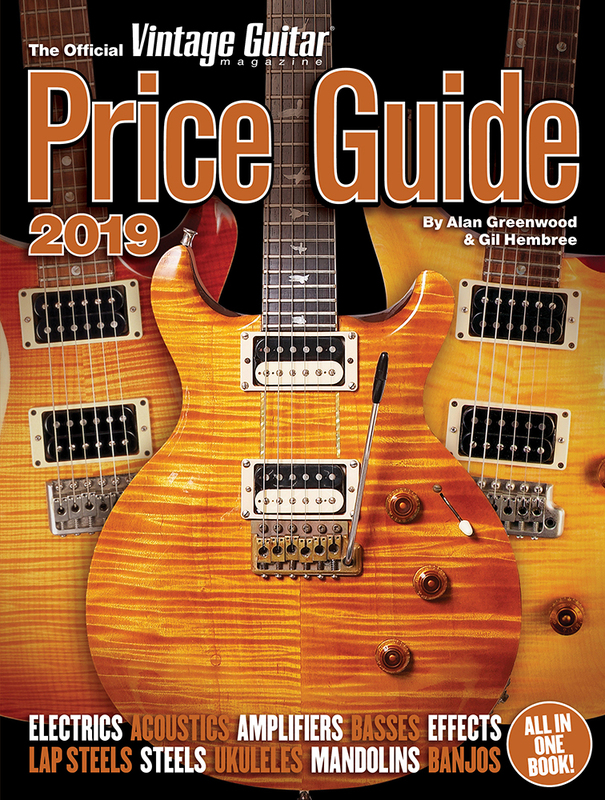 Also included was the GP, an equal double-cutaway model with a mahogany body, flamed maple carved top, glued-in neck, fine-tune bridge and stop tailpiece. The only models I’ve seen, which were also advertised, had twin humbuckers and conventional electronics. One source refers to a GP-1, which by nomenclature would suggest a single humbucker, but it’s not known if this ever actually existed. Also, it’s not clear if the GPs came in parts or fully assembled. At least one bass was offered, known as the Ultra Bass. This had a Fender-style body with one split-coil pickup mounted on a pickguard (volume and tone) and a locking Kahler bass vibrato. The body had the German carve relief. Why the Ultra Hard Bodies flopped is a mystery, since they certainly fit with the superstrat rage of the times, but they hung around for only a year or so. According to Walter Carter, Ovation briefly contracted for a shipment of solidbodies made by a Japanese manufacturer. No information is available about these, but it doesn’t really matter since only one carton of 100 or so guitars ever came in. If you find an animal that doesn’t fit the descriptions here, take a picture and let us know about it. At some point following the Ultra Hard Body endeavor, possibly in ’86, Ovation entered into a brief experimental liaison with Steve Ripley, whose Stereo guitar was offered by Kramer in 1985 and endorsed by Eddie Van Halen. A batch of 20 to 30 guitars featuring Ripley’s electronics was assembled using Japanese bodies and necks. The one in our possession is a GS2-R (#28949) with a standard (no German carve) Strat-style body, bolt-on multilaminate neck made up of red-dyed 1/16″ maple strips glued end-to-end, pointy-droopy carved bi-level six-in-line headstock, Gotoh tuners, black hardware, 24-fret ebanol fingerboard, faux-pearl pennant inlays and locking Ovation Floyd-Rose-licensed vibrato system. Two plastic-covered humbucking pickups (no exposed poles) featured individual output controls for each string, with six individual three-way mini-toggles for selecting pickups combined with six fader pots directing string/pickup output to a stereo jack. Both pickups were controlled by a separate volume control, with one master tone control. Another toggle served as a coil tap. The Ripley project went nowhere, however, the body styling would reappear on the upcoming Korean Celebrity series. It is very possible, since this shared the Ultra Hard Body model designation and was made in Japan, that the mystery Japanese guitars were essentially the same. Still not ready to give up, in ’87 Ovation contracted with a Korean manufacturer to bring in a Celebrity line of solidbody electrics. These were Strat-style guitars again, with bolt-on necks, pointy/droopy six-in-line headstocks (with a bi-level carved relief along the bottom, per style), two-octave rosewood fingerboards, triangular flag inlays, and a double-locking vibrato system. We’re not sure what the pickup brand was, but there are models with two XK-110 single-coils and one XK-120 humbucker, plastic-covered with no exposed poles. Complete information is not available, but guitars included the GC-2 with two humbuckers and GC-3 with a humbucker/single/single layout. It’s not known if there was a single-humbucker model, but there may have been if the Ultra Hard Body series pattern holds true. One twin-pickup BC-2 was offered, presumably Fender-style, with one P and one J-style pickup. Possibly a single-pickup bass was also offered. One source also lists a CG-21 with a humbucker/single/single pickup arrangement, but no other information is available. It’s not certain how long the Celebrities lasted, but one source lists them as being offered until ’89. That might be long, given what was in store. But they were, again, a marketing flop. This article originally appeared in VG‘s April. ’00 issue. 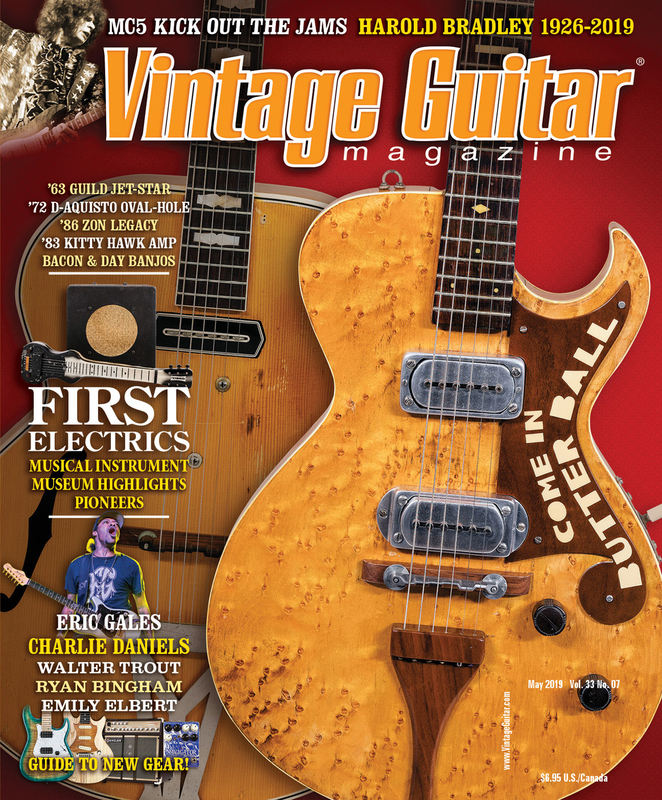 All copyrights are by the author and Vintage Guitar magazine. Unauthorized replication or use is strictly prohibited.